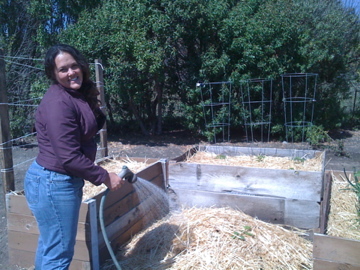 Since water is the next big issue on the horizon (if it isn’t here already), we’re looking for ways to conserve water. 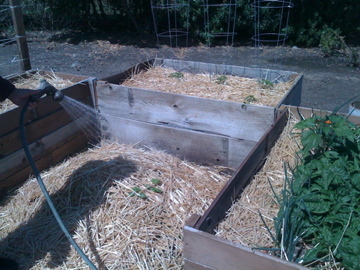 The straw keeps the soil moist and, as a side benefit, it keeps the birds off my shoots until they’re hardy enough to resist—I hope. We already lost a couple of pea sprouts to a perceptive winged assassin before I laid the straw down. But that okay, because I left the packet of pea seeds outside to help identify where the seeds were—and all the seeds in the packet sprouted. Now we have more sprouts than we know what to do with. Anyone want some pea starts? We also started a small container garden, to see how much someone living in an apartment might expect to produce. Right now we just have a single tomato plant, but we’ll expand this week. We’re going to be covering the summer planting in detail in episode 5, which I should have done in about a week. Wish me luck.